In recent years, White water snowflake was farmed in large scale. It is not only delicious but also rich in nutrients. White water snowflake was originally a wild plant grown in Meinong's Jhongjheng Lake. Before the 1980's, this plant grew in abundance in the Meinong Lake region, so the village residents picked the White water snowflake as a food source. Today, White water snowflake is sold nationwide and many farmers have invested into White water snowflake farming. Meinong is now the largest production area for White water snowflake. (If you have the opportunity to come to Meinong, do not forget to visit the White water snowflake farms after you have tasted the new wild treasures of Meinong. You will have to put on fishing waders to experience the fun of picking White water snowflake in person). Tobacco is an important crop of Meinong. 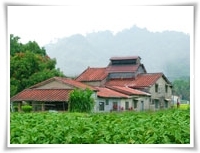 During the peak time, the tobacco plantation expanded to over 2000 hectares, accounting for 1/4 of tobacco production in Taiwan; therefore, Meinong was nicknamed the Kingdom of Tobacco. Tobacco production is extremely labor-intensive; from sowing to harvest takes up to four months. From this, we can see that the hard-working traditions of the Hakka. Tobacco towers uses to cure tobacco leaves has become a unique architecture in the Meinong area. Along with the development of economy, the tobacco industry is dwindling, but the spirit of tradition is still deeply rooted in the land as part of the memory of Meinong. The name "jade radish" comes from the adage- Jade comes from earth and gold hides in the rocks. To recover from the dwindling tobacco industry, the government has actively promote conversion of tobacco plantations into farms of white radish. Farmers of Meinong pickle the excess radish into various pickle products, including the leaves. From the end of November to early December is the harvest season of white radish. We invite and your family to come to Meinong for a tour of the rustic country and experience the fun of picking radish. Meinong Township has had a rice production area reaching 7000 hectares in between 1960 and 1970. Overproduction of rice in recent years called for a shift in land utilization; because of which, rice production in Meinong dropped to 3,860 hectares by 1994. The government has also promoted planting of organic rice in recent years. Nonetheless, rice in Meinong is more than a stable food, it is a fundamental ingredient of a variety of gourmet dishes. For examples, the Baitougong broad rice noodles, Jhulong broad rice noodles, and red broad rice noodles are the old-time flavors widely available in the town market and stores just to name a few. Meinong's Hakka has gone through a long period of hard-time, struggling from insecurity and shortage of provisions; therefore, they are accustomed to prepare for rainy days. The Hakka pioneers developed unique food preservation technologies, including drying and pickling for long-term preservation and the technologies, as well as special tastes, have been passed down for generations. Radish strips, radish threads, Fu Cai, and radish leaves are the most commonly seen dried vegetables. Meinong Hakka women are masters of pickling. Famous products include sauces radish, pickled vegetables and Fu Cai, pickled bamboo shoots, pickled cucumber, fermented bean curd, pickled winter melon, sauced pineapple pickle, and picked young ginger. Can you imagine plates after plates of green sweet potato leaves or wild lotus, garnished with pickled young ginger and stir-fried with pineapple or cordia? You will find it all in Meinong.